As we all know, World War II ended with a sailor kissing a nurse in Times Square, big ticker tape parades and everyone going back to their old lives. Except, of course, it didn’t. And the war especially didn’t end that way for the citizenry of Germany, who were faced with an enormous loss of life, devastating property damage, and coming to grips with the fact that they or many of their friends and neighbors had committed horrible atrocities. It’s a little-discussed aspect of the war, but one that director James Kent touches on in The Aftermath, a wartime romance that takes a standard love triangle and puts it in a unique setting. That setting is Hamburg, the second largest city in Germany, which was reduced to rubble in the wake of a couple of years of intensive Allied bombing raids. After the war, Germany was divided into four occupation zones, and Hamburg was located in the British zone, under the authority of the British army. The army faced a tough task; work crews are still pulling bodies out of the rubble, and much of the population was now living in internment camps where the necessities are often in short supply. Many of the residents were still Nazi sympathizers, some of them willing to carry on as a resistance force. On the other hand, many of the British troops had understandable grudges of their own, having lost friends during the war. Into this difficult situation enters Colonel Lewis Morgan (Jason Clarke) and his wife Rachel (Keira Knightley). He’s an intelligence officer assigned to help bring law and order to the area. The couple is still trying to recover from the loss of their young son in a German bombing raid. In fact, Lewis brought Rachel with him to help get her away from the reminders of the son’s death that she faced daily at home. Not surprisingly, however, the new surroundings don’t do much to cheer Rachel up, who blames every German she sees for her loss. That includes their “host,” Stefan Lubert (Alexander Skarsgard), a wealthy businessman who lost his wife in the war. Otherwise, Stefan seems to have emerged from the war relatively unscathed, living in a large mansion with several servants. His house has been requisitioned as the residence of the Morgans, but once Lewis sees the conditions in the internment camps, he allows Stefan and his teenage daughter Freda (Flora Thiemann) to remain in the home and live upstairs. It should come as no surprise to any viewer who compares Jason Clarke to Alexander Skarsgard that Rachel will eventually wind up in Stefan’s bed, an occurrence that becomes easier because Lewis’ job keeps him very busy and also keeps him upset and disturbed when he is home. What sets The Aftermath apart from most similar wartime love triangle movies is that the attraction between Rachel and Stefan isn’t purely sexual (in fact the actors don’t have the greatest chemistry together) or merely a matter of a distant husband, but, rather, a matter of shared coping with grief. In much the way that support groups help people cope by sharing their stories, Rachel and Stefan try to deal with their loss by sharing something rather more intimate. 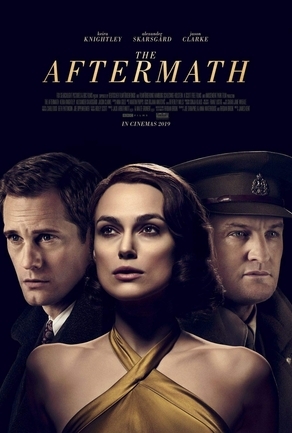 The Aftermath is based on a novel that I have not read by Rhidian Brook, and, indeed, the main thrust of the movie is how the four main characters cope with their grief. Ironically, although Lewis appears to have emerged from his loss the same professional soldier as before, his outward demeanor masks an inability to process his loss fully. Freda, a somewhat typical teenager, shows her emotions most openly of all, finding a romance of sorts with a boy who turns out to be a terrible choice. The film repeatedly contrasts how each character reacts, and this dynamic gives the movie surprising dramatic power. However, The Aftermath isn’t merely a movie about grief or even about grief and the horrors of war. Rhidian Brook actually based his novel on the wartime experiences of his own grandfather, and the screenplay (which he co-wrote), looks at the unique circumstances in which the British occupying forces found themselves, dealing with a population that contained many war criminals in hiding. More important, as far as the film is concerned, is the question of exactly what constituted a “good German” of that era. What was the degree of knowledge, acquiescence, and culpability? Had The Aftermath portrayed Stefan as a morally gray individual (which, quite frankly, a wealthy businessman of that era probably was), aware of at least some of what the Nazis were doing but willing to look the other way, then his affair with Rachel and, indeed, his entire treatment by the British would have made for a far more complex and powerful movie. Instead, the script touches on the issue, in a scene in which Stefan is interrogated by Lewis’s subordinates while trying to get a travel visa, but allows Stefan the safe harbor of being conveniently and implausibly unaware of the true nature of the war around him. Despite the convenient simplification of some of the complexities that the film touches on, The Aftermath works quite well as a drama. The romantic elements are there, of course, but in the end, it’s the characters working out just what they want out of life that matters. Here, Keira Knightley again demonstrates how good (and underrated) an actress she is. But credit is also due to Jason Clarke, an actor who rarely rises above the script in any movie but does some of his best work in years here. 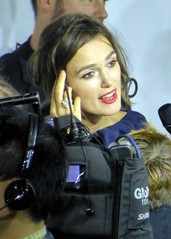 The script makes the character much more three-dimensional that one might think based on the trailer, but Clarke manages to make the role work. The Aftermath could have been a superb war movie if it fully developed all the plot threads that it introduced. Instead, the previously mentioned copout about Stefan’s past and a completely unnecessary action sequence towards the end of the movie drag it down somewhat. If this movie had appeared in the 1950s, the backdrop and romance alone might have made it successful. But World War II films that don’t feature the bizarre (like Overlord) are a hard sell nowadays, and The Aftermath never fully succeeds. Instead, it’s a well-acted and reasonably successful, albeit too shallow, look at a complicated time that’s rarely received cinematic treatment before. There’s a great movie to be found in this subject matter, but for now, we can settle for a modest accomplishment. In this clip, Keira Knightley gets intimate with Alexander Skarsgard.